Browse hospital-furniture suppliers by country and region. Listen Medcal Technolog Co., Ltd.
Short on time? Let hospital-furniture sellers contact you. We are professional manufacturer of wheelchair and rehabilitation products in china. Our products are mainly for export. We can produce: manual wheelchair, powered wheelchair, electric scooter, underarm crutch, forearm crutch, bath bench, cane, quad cane, commode chair, walker, rollator, hospital bed and hospital furniture, etc. Carton. Four section bed platform made of epoxy coated steel sheet with ventilation holes Mechanical adjustment of back & footrest Trendelenburg adjustment by gas spring Fold down side rails IV pole sockets in four corners of the bed Easily removable Polyp head & foot boards 125 diameter swivel lockable castors Protective corner bumpers Technical Data: Backrest angle: 0-80º Footrest angle. 0-40º Trend: 0-12º Height: 50 cm Length: 206cm Width: 96cm Weight: 85 kg Mattress Size: 90x190cm. 224x106x80 cm. Laminate top resistant to water and heat Drawer and cabinet door Epoxy coated steel structure Four castors Size: 40x40x80 cm. 45x45x85. 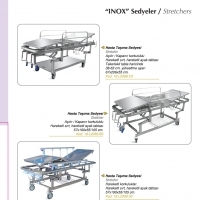 Medical trolley with removable and three folded edged shelves which is used for medical equipment and devices. • 304 stainless steel body. • 2 pieces 304 grade stainless steel folded and removable shelves. • Antistatic shelf buffer against impacts and noises. • 4 removable castors. (With antistatic and brake options.) • Double side removable shelf design for different intented uses. • Bumpers on the wheels against impacts.